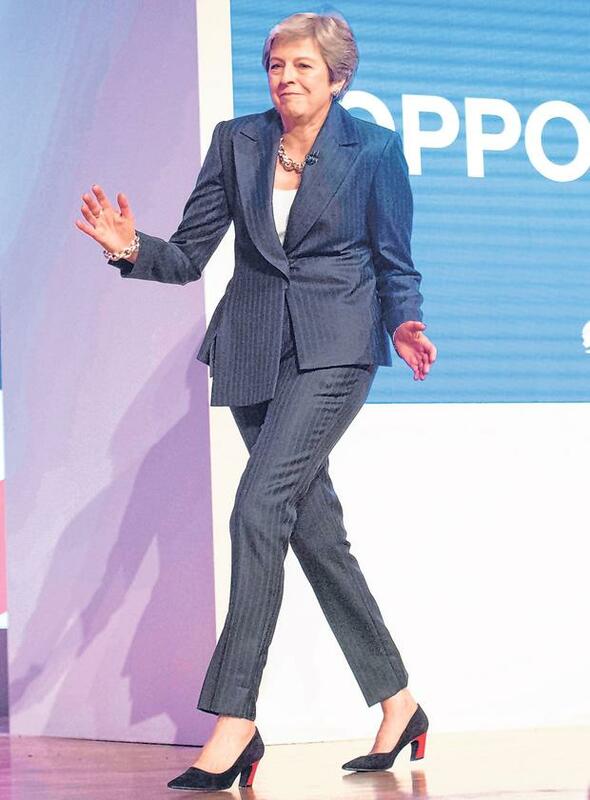 Dancing in the dark: Theresa May arrives onstage to the sound of Abba at the Tory party conference last year in Birmingham. British Prime Minister Theresa May claimed that the UK would leave the EU on March 29 more than 100 times. Brexit D-Day came and went and it hasn’t left yet. The 1,010 days since the Brexit referendum have been marked by many bizarre moments. Here are 10 of the strangest. Pundits were flabbergasted by the result of the June 2016 vote. While the tiny British territory of Gibraltar announced first with a 96pc vote to stay in the EU, it was a freak result and Remainers looked on with horror as the night wore on. The writing was on the wall when it was announced Sunderland voted Leave by 61pc. David Cameron’s resignation sparked a bitter contest. The favourite, Boris Johnson, ultimately didn’t run and Michael Gove – who denied stabbing Mr Johnson in the back by entering the race himself – was eliminated early. It came down to Andrea Leadsom and Theresa May. Mrs May was the last one standing. Mrs May had promised that “Brexit means Brexit” and she set out her vision on how it would play out in her Lancaster House speech. She set out red lines of leaving the single market and customs union, denying herself wriggle-room in later talks. Mrs May lost her Commons majority in June 2017 after her decision to hold a snap general election. It left her relying on DUP support, making passing the Brexit deal all the more difficult. Taoiseach Leo Varadkar said the UK government’s commitment to avoid a hard Border in Ireland was “politically bulletproof” in December 2017. He may have jumped the gun on that, with the so-called backstop – which hardline Brexiteers and the DUP oppose – causing much of the misery since. Donald Trump – a pal of arch Brexiteer Nigel Farage – said as far back as 2016 the UK would be “better off” outside the EU. He has since indicated he wants an early trade deal with the UK. And Mr Trump has been openly critical of Mrs May’s approach to talks most recently during his Oval Office meeting with Mr Varadkar earlier this month. At the Conservative Party conference in 2017, she suffered the indignity of being handed a P45 by a prankster and coughed through most of her speech. Last year, she danced on stage to the tune of Abba’s ‘Dancing Queen’, poking fun at her own awkward dance moves during a trip to Africa. In January, the Irish Independent revealed how Tánaiste Simon Coveney warned Transport Minister Shane Ross not to discuss the possibility of Border checks in Ireland in public. Mr Ross had bungled a question and their subsequent conversation was caught on tape. European Council President Donald Tusk questioned in February if there was a “special place in hell” for those who promoted Brexit without a plan. Mr Varadkar, who was with him at the press conference at the time noted Mr Tusk would get in “terrible trouble” with the British press for the intervention. He wasn’t wrong. Mrs May cancelled a vote on her Withdrawal Agreement at the last minute in December. As the clock ticks down to Brexit, it subsequently failed to pass three House of Commons votes – the latest being yesterday.